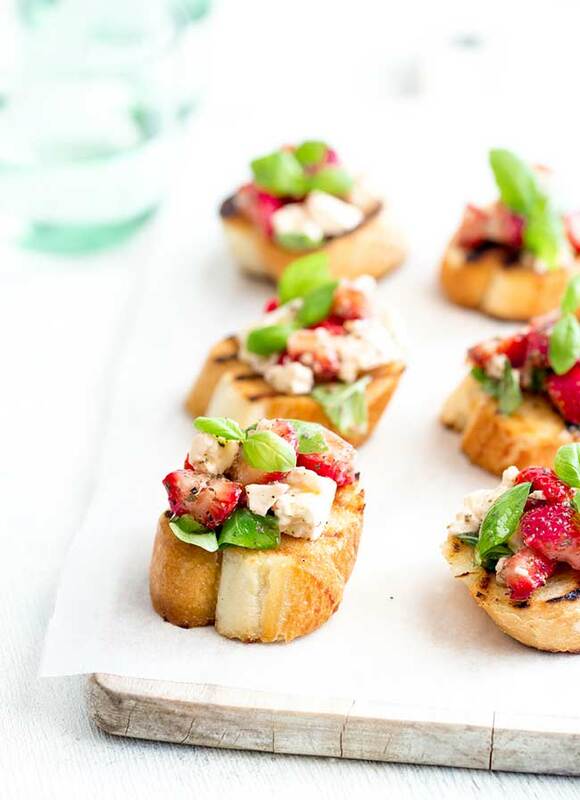 These Strawberry and Feta Bruschetta have to be the ultimate summer snack. 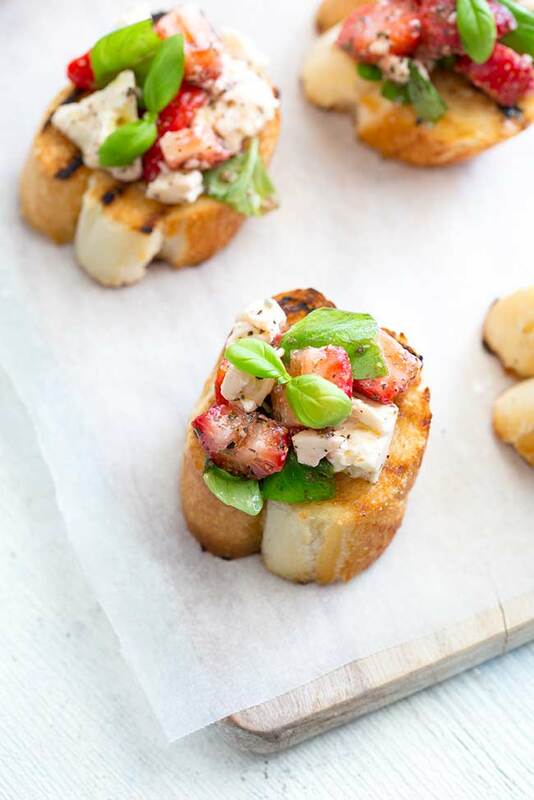 Sweet strawberries, salty feta, fragrant basil and the subtle bite of white wine vinegar all mixed together with a grassy EVOO and piled on top of crisp toasts. So delicious, so pretty and perfect for a mid-summer lunch party. A long weekend by the lake, the most fabulous wooden house on the shores of Grand Lake, soft rippling water and the stunning Shadow Mountain backdrop. The kids have already explored every corner, falling into bed last night, exhausted and happy. Today they are off fishing, you expect 8 wet smelly children and 4 equally smelly Dad’s back in a few hours but for now, you and the girls can sit back and enjoy your lunch. A picnic of bruschetta, salad and poached trout. And a few hours peace and quiet. But as the bottle of bubbles is opened and laughter fills the air you realise that four lifelong friends together for a weekend, will never mean quiet time, but it will be the best of times. We all love bruschetta, crisp toast, rubbed lightly with garlic and topped with delicious fresh tomtaoes. 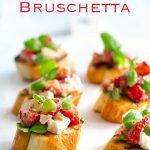 It is a classic, but these Strawberry and Feta Bruschetta are something a little bit different, and great for when strawberries are super ripe, it is also perfect for when your strawberries are on the verge of turning soft. Just don’t use mushy strawberries. The crostini toasts can be made up to 48 hours ahead of time. Just to sure to keep them in an airtight container. However the bruschetta topping needs to be made on the day. 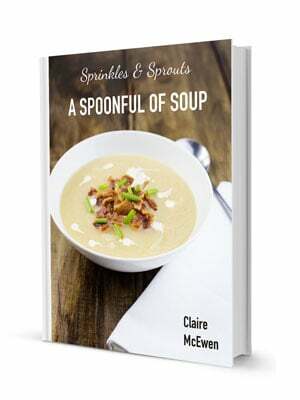 The vinegar in the recipe will turn everything mushy if it is left on there too long. 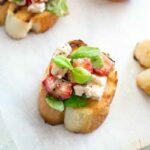 Once you have assembled the Strawberry and Feta bruschetta, serve them pretty quickly as the toppings can make the crostini toasts go soggy. If you aren’t sure how quickly they will be eaten, then serve the topping in a bowl so people can assemble a bruschetta for themselves. Bruschetta is pronounced with an emphasis on the sch which the Italians pronounce as a SK. So bruschetta is pronounced “broo-sketta”. Don’t you just love it!!! The recipe calls for some dried basil and then fresh basil at the end. Don’t skip the fresh basil, it is so worth it here. Cut the strawberries into small chunks and place in a glass bowl. Add the vinegar, EVOO, sugar, black pepper and dried basil. Stir them gently and then put them to one side for 15 minutes to macerate. Heat a a griddle pan over a medium-high heat. Brush both sides of the bread slices with olive oil. Then grill for 1-2 minutes a side until they are golden with slight charring. Crumble the feta into the strawberry mixture, add the basil leaves and stir gently to combine. Pile the toasts with the strawberry mixture and drizzle over a small amount of the soaking liquid. You shouldn't need any salt as feta is quite salty. But if you mixture needs it, add it to the top of the bruschetta as you serve or it will make back spots on your basil leaves. 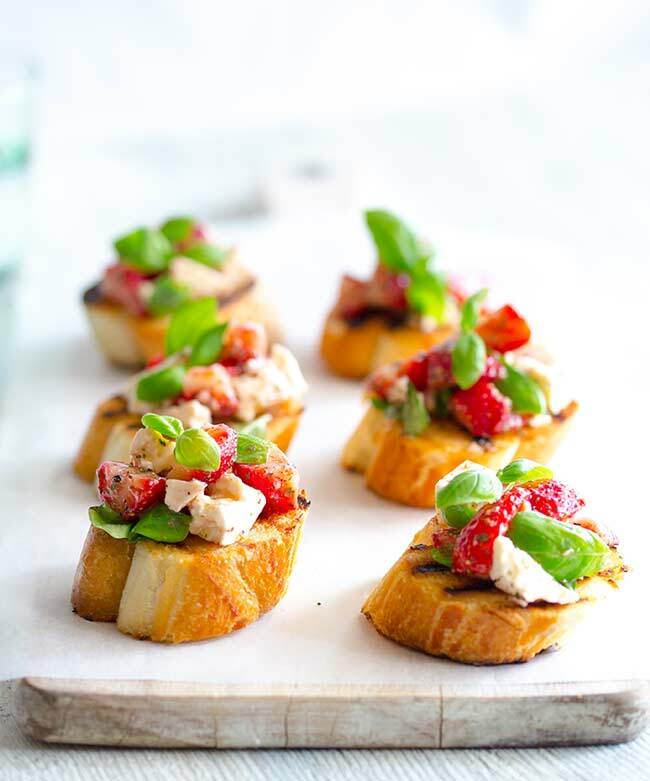 If you love food why not subscribe to my newsletter, I will drop you an email every now and then, just to say hi and send you a couple of recipes think you might love, like these Strawberry and Feta Bruschetta. This is the perfect summer appetizer! And the sweet + salty combo is delicious!